Setting up your Quick Keys for Mac and PC – How can we help? Important: If you are using the Vend sell screen on Mac or PC, make sure you setup your Quick Keys using the following guide. 1. In Vend, navigate to Sell -> Settings in the sidebar menu. 3. Give your new Quick Keys layout a name. 4. Choose whether you would like quick key folders to stay open after selecting a quick key from it. Once you have given your Quick Keys layout a name, navigate to the Add Products section below. When you are happy with the additions and amendments you've made to the layout, click Save. To add a Quick Keys product to your layout you can either search for the product using the search bar or use your barcode scanner to scan a physical product. If you wish to add a vairant product as a Quick Key, you will need to search for the product by SKU code and hit enter on your keyboard. By default, your Quick Keys will be added to the next available space in the layout. If you'd like to specify where the next Quick Key will go, select an empty space in the layout. If you have already added a Quick Key but wish to change it's position, click and drag the Quick Key to a new blank square. 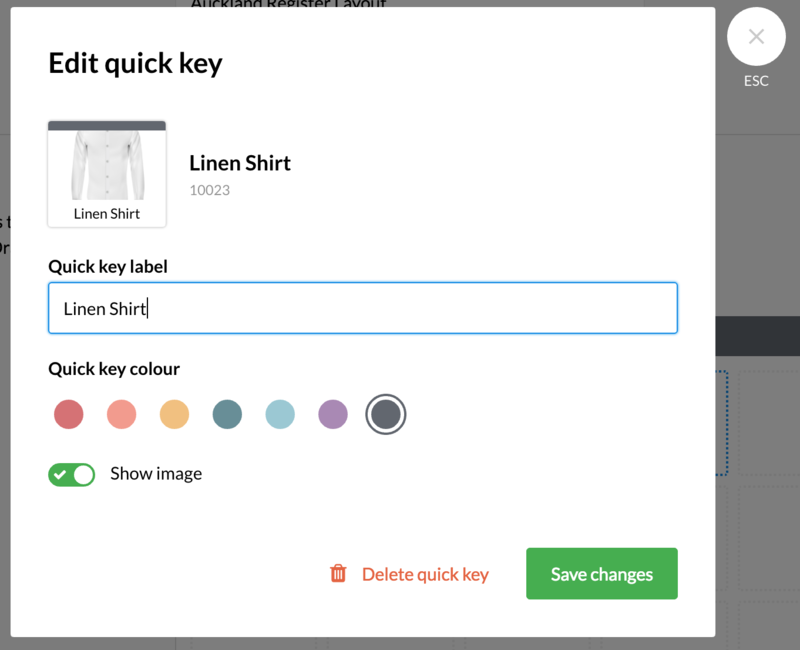 To create a Quick Keys folder, click and drag one product Quick Key onto another. To add more product Quick Keys to this folder, click and drag them into the folder. When you are editing your Quick Keys layout you can select a single Quick Key to edit its details. On this screen you can edit the label name of the Quick Key, enable an image and change its colour. Tip: You can also click on a folder to edit it's name and colour. To enable or disable product photos on your quick keys, choose the quick key you would like to edit and click on the 'Show Image' toggle. This will take you to the edit product page where you can drag and drop image files onto your product. To delete a Quick Key, click on it in the layout edit screen and select 'Delete quick key' at the bottom of the window. In addition to adding new Quick Keys layouts, you can also manage your existing layouts right from the Settings page. If you'd like to change the current layout of the register you're logged into, click the 'Set as current layout' button on the layout you wish to change to. To edit an existing layout, click the pen icon to the left. This will bring you to the Quick Keys layout edit screen where you can add new Quick Keys and edit the order of your Quick Keys. Click on the duplicate icon to create a copy of your current layout. This is a great way of modifying an existing layout for use on one of your other registers. Note: While a new layout will appear automatically when you do this, it may take up to 5 minutes for the contents of this layout to sync. To delete a layout, click the trash can icon to the far left. 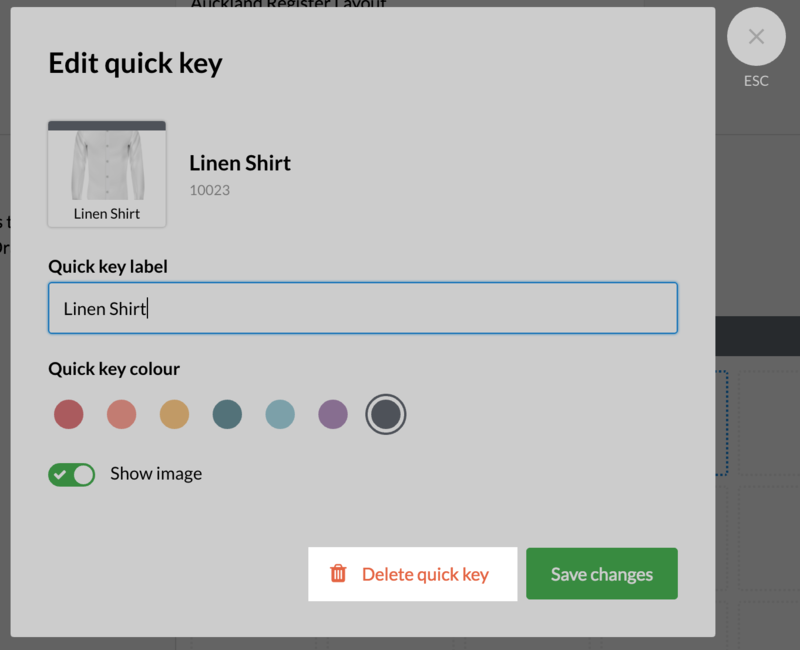 If you'd like to enable or disable the Quick Keys layout for the register you're currently logged into, click the 'Enable Quick Keys in my store' toggle above the 'Add new layout' button. Note: You can toggle your Quick Keys on and off at anytime without losing your Quick Keys settings.